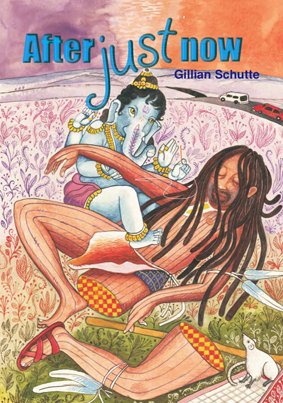 Gillian Schutte’s After just now is signified by a multitude of juxtapositioons and layered realities. Kali, Shakti and Ganesh cavort alongside Xhosa warriors, Afrikaner folk and wild beasts which populate Lila’s psyche. The narrator not only projects for us a kaleidoscope of intermingled world cultures, but also travels a spectrum of time zones: historical ( back to the 18th century, to the intersection of Lila’s Afrikaner roots and the Xhosa lineage of her husband, Lunga); personal (recounting in diary format the harrowing events of her destabilised life); psychic (portraying slippage between ‘reality’ and out- of -body dream scenes); and spiritual, with orgiastic descriptions of mystic experiences, both Christian and Hindu. This short novel uncannily intermingles past and current socio-political events, a cathartic account of personal history, the ecstasy of self discovery, personal growth and salvation. A journey not measurable in linear space or chronological time, but only open to experience after just now.